helping to teach math and arts & crafts. The school’s students naturally gravitate to them, thanks to the twins’ playful and kind demeanors. Outside of work, Anina and Alexa love to hike with their parents, socialize, travel, and go for bike rides. At age 27, they live happy lives, and with the help and support of their parents, guide others to embrace the same positivity. But 25 years ago, Ingrid wasn’t sure how to take the news when her two-year-old twins were diagnosed with neurofibromatosis. She had never heard of the genetic disorder before. When the girls were first diagnosed, Ingrid cried for days. But in some ways it was also a relief – the family had been concerned about the girls’ delayed speech development, and with a diagnosis they could begin to properly address any learning and health difficulties. In many ways, Ingrid felt isolated at first – after all, 25 years ago, NF was talked about much less than it is today. Even many doctors and health specialists, Ingrid found, weren’t always familiar with the disorder. Luckily, with the help of BCNF, Ingrid was able to find resources and, most importantly, friends. Of course, raising her twins, Ingrid hit road bumps along the way – as any parent does. Her and her husband’s consistent positivity and strength has kept the family happy and striving, even if in recent years, the increasing numbers of fibromas occurring on the girls’ skin has provided additional hurdles. Through this mentality, she has taught her girls traits and virtues that any mother should hope to impart to their children: self-esteem, openness, and the pursuit of joy. 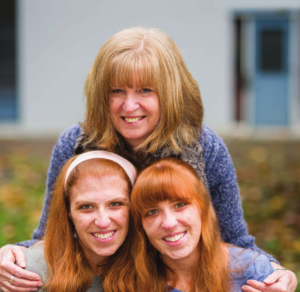 While Ingrid has worked to ensure Anina and Alexa live fulfilling lives, she has experienced frustration at the lack of local treatments available for the disorder. In particular, she’s had great difficulty finding plastic surgeons in BC who will treat patients with NF. “Research is good, but we also need to find people who are willing to help treat and remove the fibromas. There’s a piece of equipment we need, that I haven’t been able to find in BC. It would make such a big difference to so many people,” she explains. In a society that places such high value on physical appearance, patients’ quality of life can be vastly improved once cosmetic treatments are made available for the disorder. It is therefore understandable that a mother would search high and low for a centre that will address these physical concerns for her two daughters. And perhaps it is because of the existing stigma around physical ‘defects’ that the girls have found such solace in a local anime community. When asked for words of advice for parents currently raising children with NF, Ingrid’s amazing energy shines through yet again. “You have to stay social. We have a lot of learn from each other [in this community]. We socialize a lot, we hike, and we bike. We live busy lives. And in many ways I’m very lucky, because my girls have each other throughout all this.